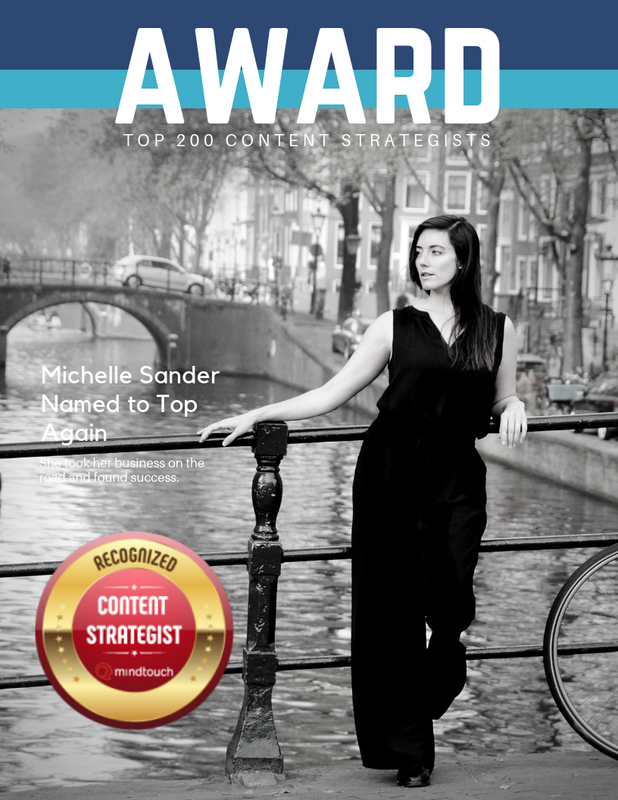 Congratulations to Michelle Sander for being named to the Top 200 Content Strategists for the second year in a row. MindTouch evaluated thousands and created a measurement that takes into account a wide range of metrics including internet presence, influence, and community engagement and Michelle Sander made the cut. The list includes the likes of Google, Airbnb, Meetup, Entrepreneur Magazine, and Microsoft, so Michelle is in some great company. Content marketing and content marketing strategy aren't terms that everyone is familiar with, so let's take a moment to clarify. Content marketing is the creation and distribution of online material (videos, blogs, and social media posts) that don't explicitly promote a brand, but, instead, stimulate interest in its products or services. The end result is an increase in brand engagement, conversion rates and, ultimately, sales. Creating quality, relevant content is also key in building Search Engine Optimization (SEO). Content marketing is all about aligning content production to a strategy that is focused on creating devoted followers. Content marketing paired with a solid strategy allows you to create customers and future customers who are die-hard, loyal fans of your brand. Content marketing focuses your brand squarely on a target market. Creating quality, impossible-not-to-share content establishes you and your brand as an expert in your respective field, it builds trust, and it creates more opportunities for engagement and ultimately sales opportunities. This is what a good content marketing strategy can do for you and your brand. If you need help with your content marketing strategy and how to implement it, send a note on the Contact page. Michelle Sander is one of the top content strategists and she can't wait to chat about how to build engaging content for your brand. Number 19 this year. Up one spot from #20 most influential #techcomm expert last year.